Tomorrow, Saturday 27 January, is Holocaust Memorial Day. We remember the Holocaust to serve as a statement to all generations that the brutality, tragedy and loss, that had its roots in prejudice, can never be repeated. We continue to remember the events of over 70 years ago because we must keep alive the memory of the Holocaust and the actions of the Nazis across Europe, to ensure the world never stops learning the dangers of prejudice, anti-semitism and all forms of racism. Six million Jewish people were killed in the holocaust, and many kept in the shocking conditions of death camps across Europe, including Auschwitz-Birkenau in Poland, the largest of the Nazi concentration camps. 27 January marks the anniversary of the liberation of Auschwitz-Birkenau and is the date that we remember not just the victims of Nazi genocide but also subsequent genocides in Cambodia, Rwanda and Darfur. 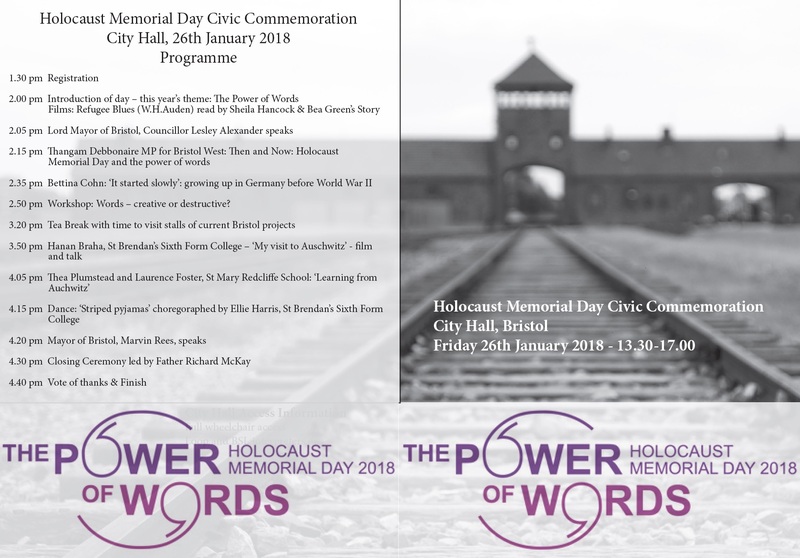 I spoke today at the Holocaust Memorial Day Civic Commemoration Event at City Hall, organised by the Bristol Holocaust Memorial Day Steering Group. I was pleased I could spend time honouring the victims and survivors of these regimes of hatred. We must continue to challenge ourselves to learn the lessons of their experience to inform our lives today, to challenge racism and discrimination wherever we find it. Holocaust memorial Day recognises the development of genocide. We can see it is a process that starts with discrimination, with racism and with hatred. If not checked or challenged, it cannot be prevented. The theme of this year’s Holocaust memorial Day is the power of words and many will be familiar with the powerful stories of the survivors of genocide. It’s also an opportunity to ensure we are careful with words, to educate others and ensure that even the most casual of racist language is challenged for what it is.